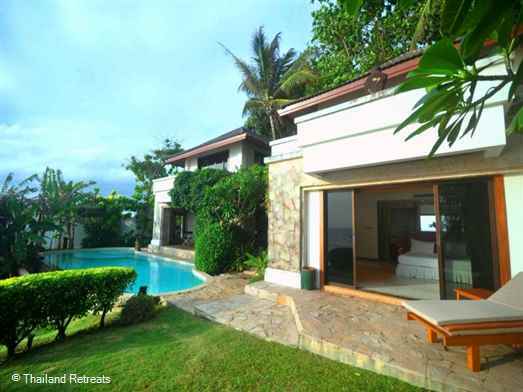 This Balinese style villa is right on the oceanfront, it is very private and secluded surrounded by lush tropical gardens. 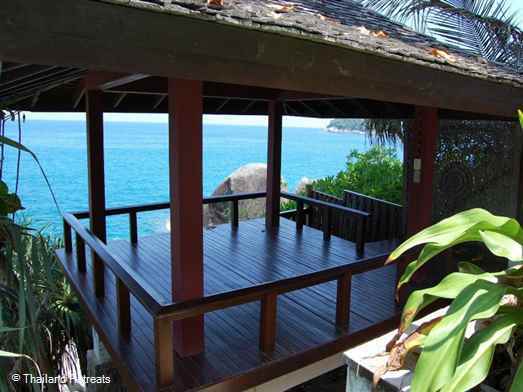 It is a 10 minute walk from Kata beach. 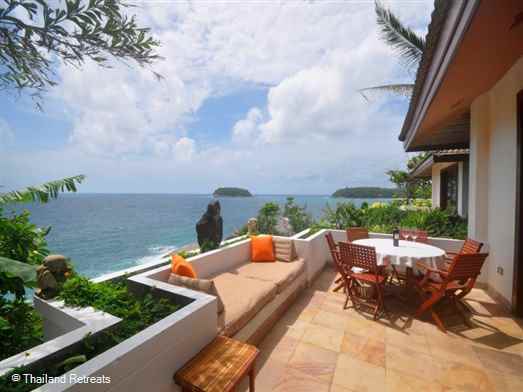 Cape Kata Villa is a 4 bedroom oceanfront property located on the Kata headland on Phuket's beautiful west coast and within 10 minutes walking distance to two white sand beaches. 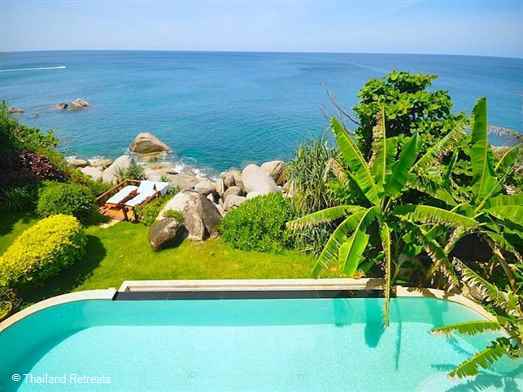 This great 'secret villa' in it's own private walled secure estate is hidden away from the crowds and is a simple and charming retreat which gives guests a sense of discovery of something secret, hidden and adventurous right over the deep blue ocean. 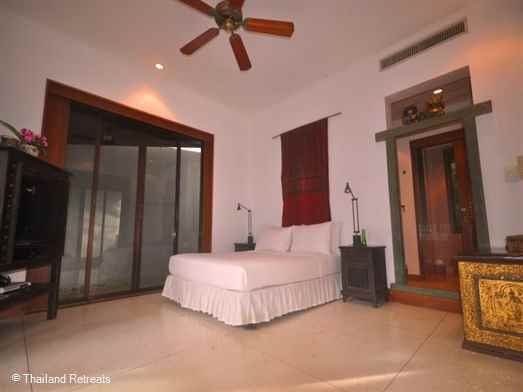 Cape Kata has 4 air conditioned ensuite bedrooms in a pavilion style property with Balinese and Japanese design influences and accessed by a stepped garden pathway from the estate car park down through a picturesque private garden. 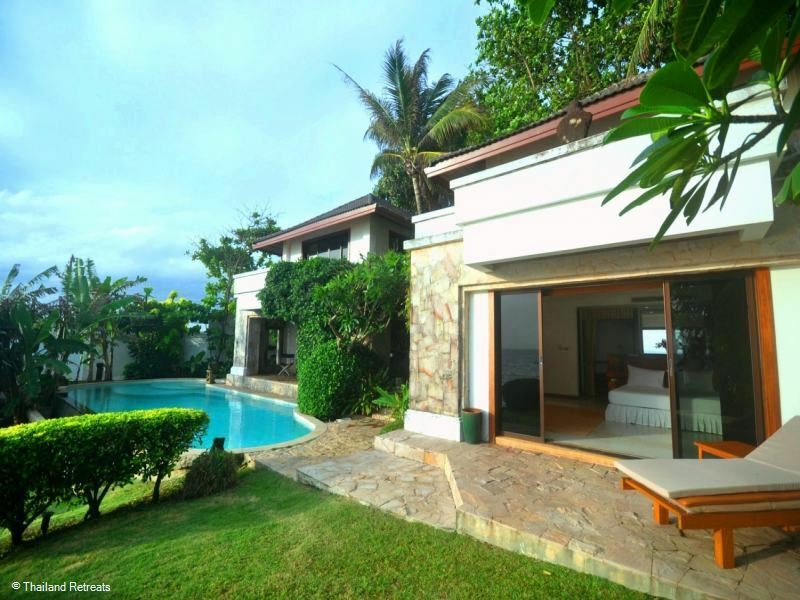 Flanked by Carp ponds the villa is entered through ancient Balinese teak doors into this beautiful property set amongst natural granite bounders and tropical trees. 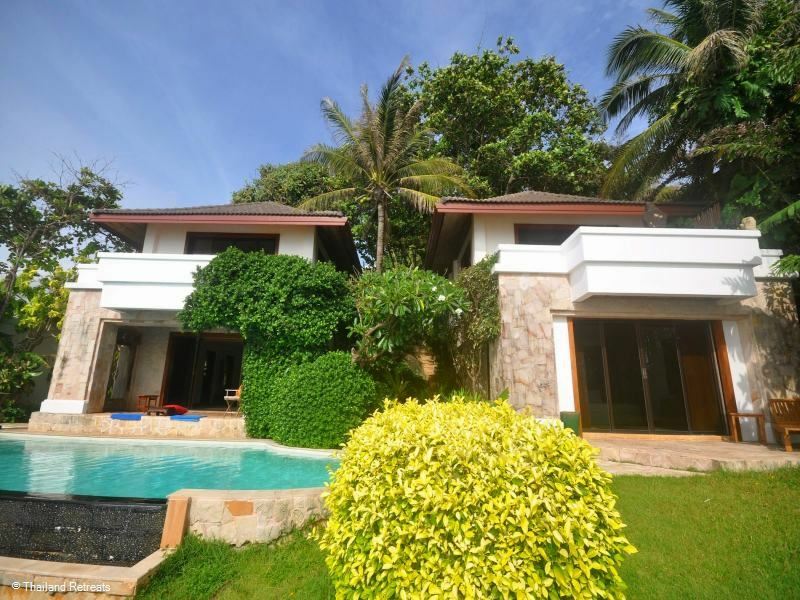 The accommodation provides space and privacy and occupies the two wings of the property, in front of which are a lovely swimming pool within a grass lawn area. There are two oceanfront relaxing areas above the seafront rocks - a covered open air sala and an open wooden deck. Both the master bedroom suite and upper living area have pleasant open balconies to view the ocean. The villa kitchen is housed in a dedicated staff pavilion and is used to prepare the meals for the guest The guest accommodation has a simple bar style kitchen with microwave, fridge and sink. 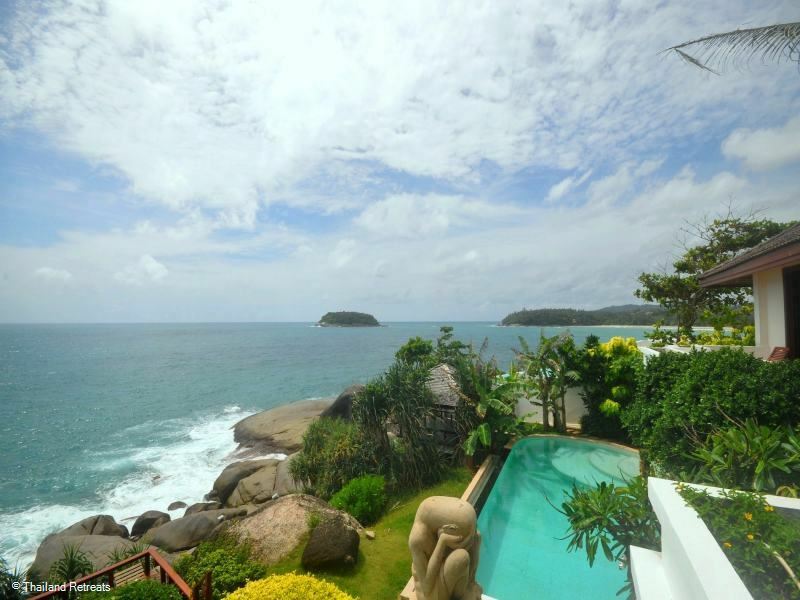 The property was one of Phuket's first west coast oceanfront luxury villas and has a simple charm in terms of accommodation, but an awe-inspiring location on the headland between Kata and Kata Noi beaches which is second to none. 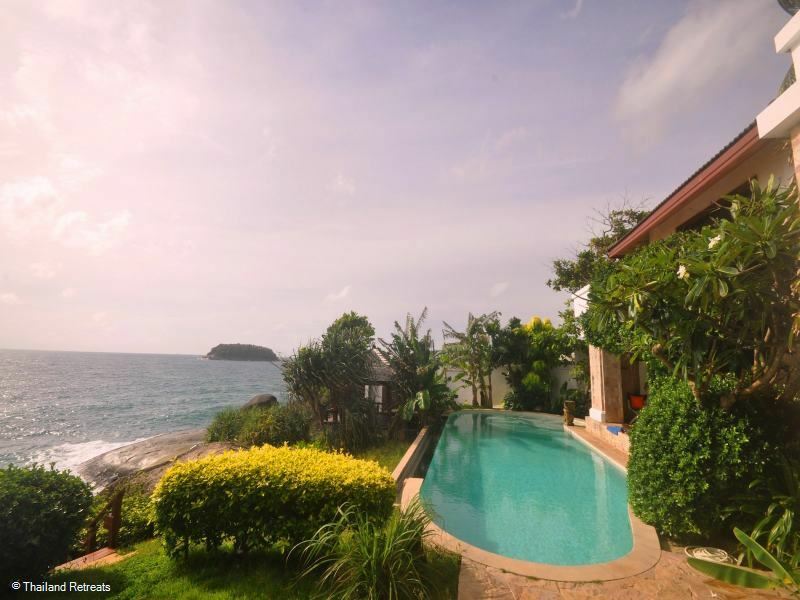 Whilst not the most modern villa on Phuket, few have such character and even fewer the absolute A1 oceanfront location between two of the islands best beaches. 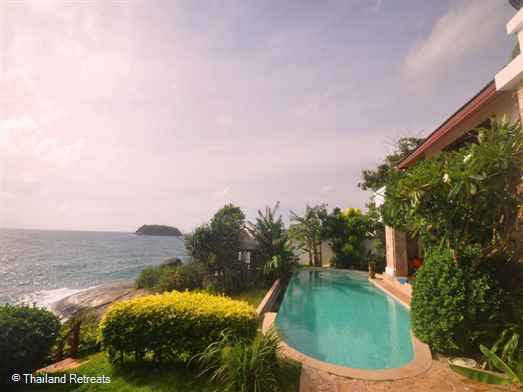 Due to the villa's more simple nature, the pricing for such an outstanding location is far less than any other Phuket four bedroom oceanfront west coast villa, so you can live on the waters edge at an inland villa price! Competition for vacancies can be intense so we advise booking well in advance. Please note that the landscaped pathway walk down to the villa from the car parking area is gentle, but has just over 80 steps so may not be ideal for older guests or those with many very young children. 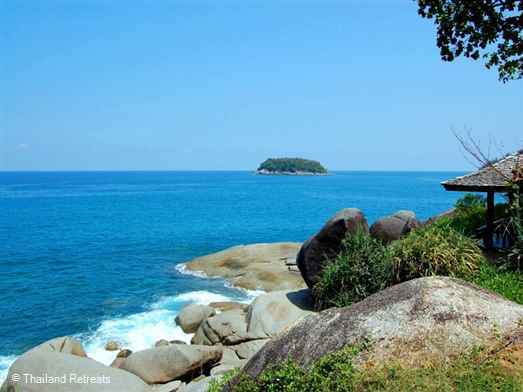 Kata Noi (small ) beach is a 10 minute walk from the villa to the south. It is just as charming as the Kata beach, just with less people and perhaps even whiter sand ! 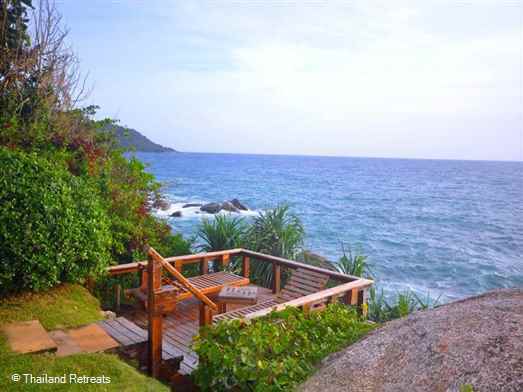 From Kata, you are only 10 minutes from Chalong Bay and boat access to Phi Phi and Racha Yai islands. The south of the island has many tourist attractions, elephant trekking, ATV riding snake and monkey shows as well as cultural shows. The number of Oceanside cafes and restaurants is huge. Kata is definitely a place to come and relax or expend some energy as you choose! Natural open air, Bali style rock showers. Great place - used it as our base for the King's Cup Regatta in December for nine days. Fantastic chef, superb views and ideal for our purposes. Looking forward to our return journey. 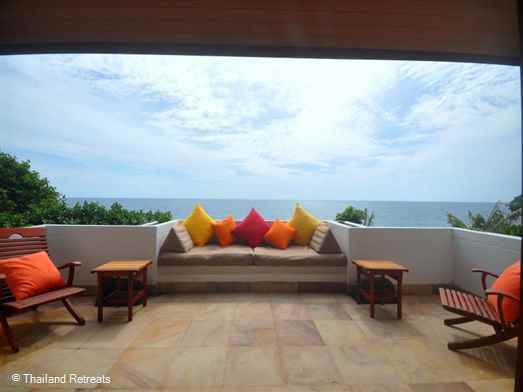 We stayed in Cape Kata Villa for one week in June 2015. 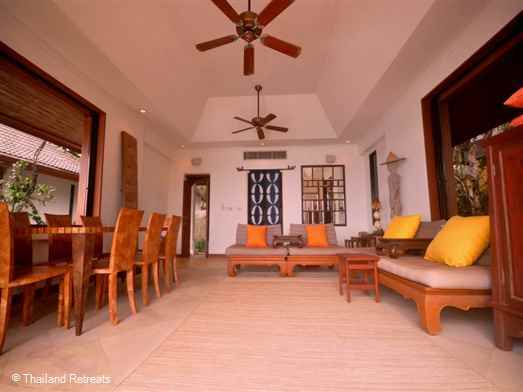 Firstly I have to mention the views and outlook from the living space and 3 of the 4 bedrooms are fabulous. The Villa is situated between Kata and Kata Noi Beaches, on top of the cliffs on the point. 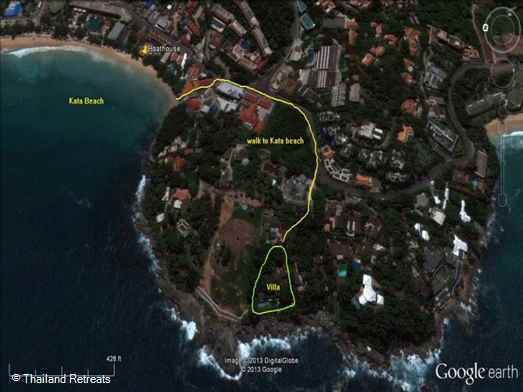 It is a 5-10 minute walk to either beaches, both are beautiful. 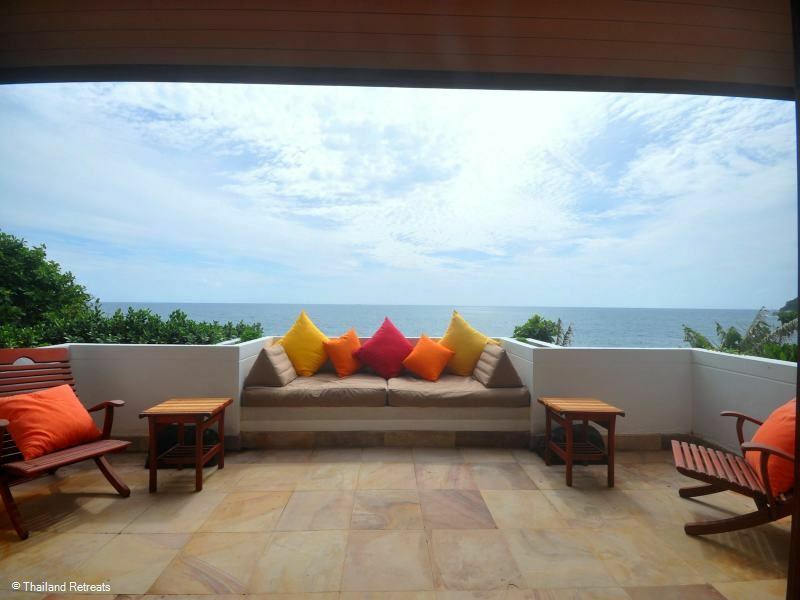 Kata area is known to be family friendly, have great dining and shopping options without the hustle and bustle of some of the more populated areas on Phuket. The accommodation is made up of 4 individual bedrooms, each separate with own access, a shared traditional Thai style living room with balcony and small kitchenette. 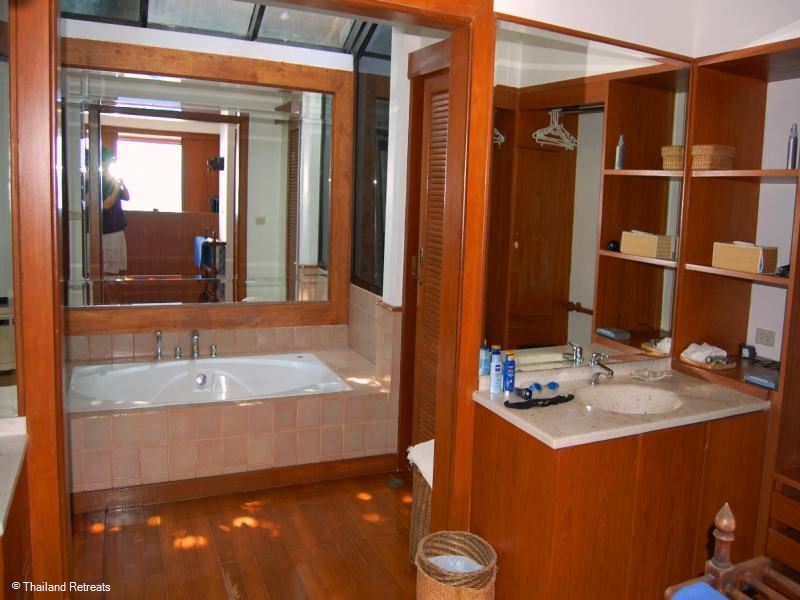 Some of the bedrooms are more plush than others, and one of the bathrooms was extremely basic while the others were much more luxurious. For the cost of the villa a little money needs to be spent on getting these up to scratch. This is why I have rated 4* rather than 5. At the same time keep in mind the villa is more affordable than many others that are similar and this is the reason. Generally the rooms are comfortable, well looked after and clean. The villa is down many stairs and over two levels so I would only recommend for able bodies and not young toddlers. We stayed with two children aged 5 and 10 and it was not a problem for them. The landscaping, gardens and pool are lovely. The Pool was very deep but had good wide steps for sitting or for kids and the water was a good temperature and has sea views. There are places to lie in the sun or shady spots to sit in the garden near the pool. The Villa has two staff living on site who make you feel very much at home. They look after the cleaning, breakfast and anything else generally that you need. Nok the cook is amazing, she produces fabulous Thai feasts which cost only the grocery bill. We stayed in several nights as the food was just too good! The kids loved her spring rolls and pad-thai. Nok can either surprise you or take requests for Thai favorites and even has cook books you can choose from. If you're not in to Thai food (apparently there are people out there that aren't!) go out, there are so many fantastic restaurants near by. We had a wonderful stay, very relaxing and would absolutely recommend heading here for a week. 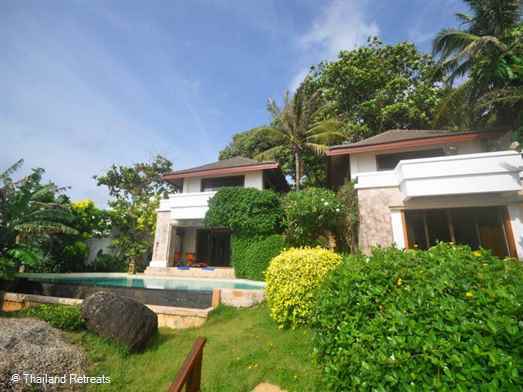 Our family of 5 (2 adults and 3 children ages 12, 10 and 4) stayed at Cape Kata Villa for 7 nights in the beginning of April. 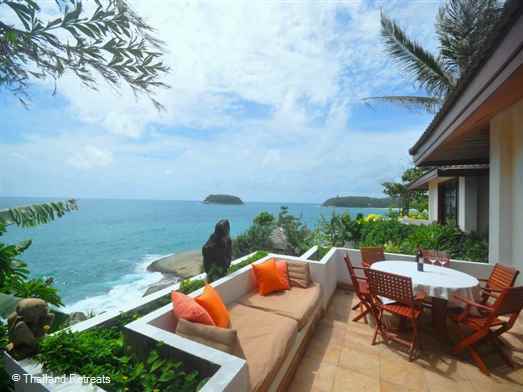 This property is ideally located within walking distance of Kata Beach and Kata Noi Beach. The property is set up with 6 individual buildings, built into the side of the hill. One is for the housekeeper/chef, Nok, and her family. One is a dining room with mini fridge and microwave. The other four are bedrooms. We used three of these as our youngest is a little too young to stay in a room separated by stairs/walking. The complex is very warm and comfortable, but it is not updated to the latest modern style. The beds are comfortable, everything is clean and well cared for, so we didn't mind that everything wasn't shiny and new. Plus, the cost for this place and this location is a very good value. Highlights: The food is amazing. You can sit will Nok everyday and plan the menu for breakfast and lunch/dinner. We ate amazingly well. She is a great cook and it was so relaxing to have breakfast and dinner taken care of each day. We spent a lot of time touring Phuket and playing on the beach. 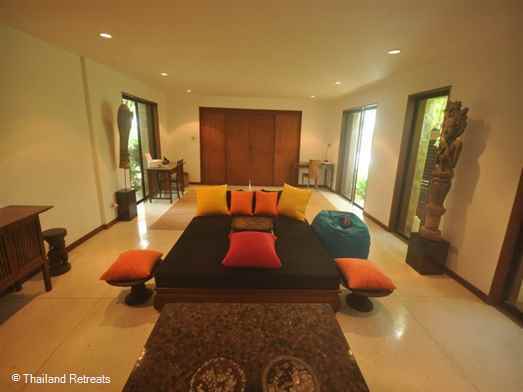 The villa was a welcome relief at the end of each day. We relaxed in the pool and took in the view each evening before dinner. There are a number of stairs leading down to the property. We are a family that enjoys walking so this was not an issue for us. Only when our youngest was exhausted, did we have to carry her. This would be difficult to navigate if you have children that need a stroller. My only improvement suggestion would be that when we arrived, we didn't get a very thorough tour of the property. It would have been nice to have someone meet us there and give us a tour/welcome. The driver and Nok did their best, but it didn't seem to be within their comfort zone. Overall, we wouldn't hesitate to stay here again. The villa has a unique and wonderful location - looking straight out to sea. It feels very "away from it all" despite being a short walk into Kata and to the beaches. 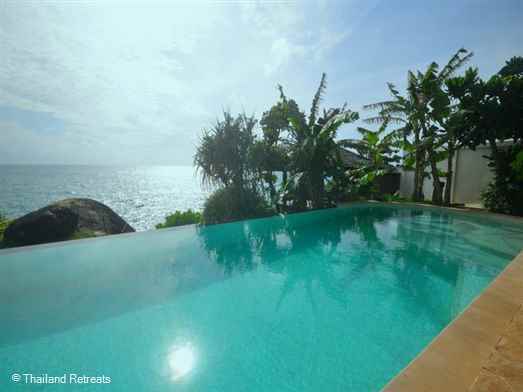 The villa layout is very spacious, and the pool is very good sized - proper swimming space with a wonderful view of the sea. 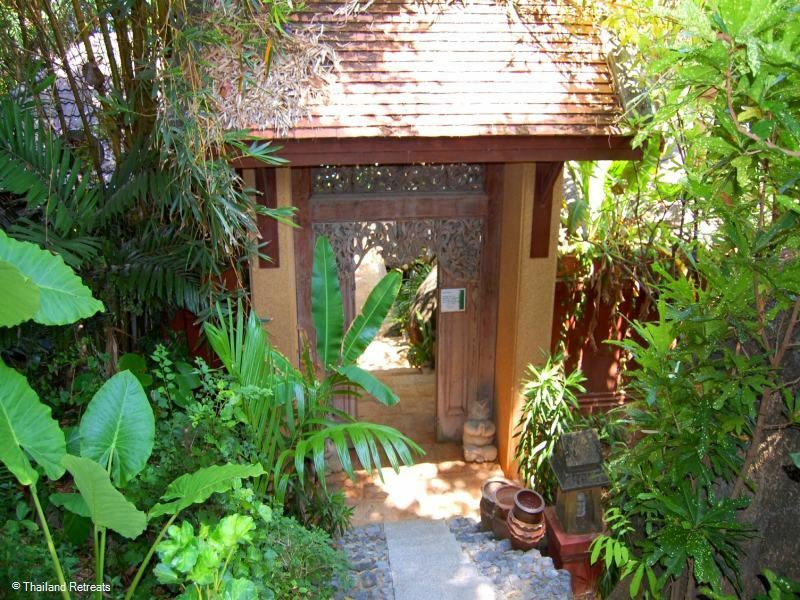 Nok, the housekeeper is a wonderful cook - serving up fabulous Thai food every evening. We had a wonderful Christmas break. The only thing to be aware of is that are quite a few steps down to the property, and within the property down to the pool area and downstairs bedrooms so for small children or people with mobility issues there may be some challenges. It's a really lovely secluded location. We have never stayed on the oceanfront before and found it amazingly rejuvenating with it's carefree, sunset walks to the beach. The villa is not so fancy, but neither are we - so all in all, I'd recommend it. Oh, and the cook is very good yes. 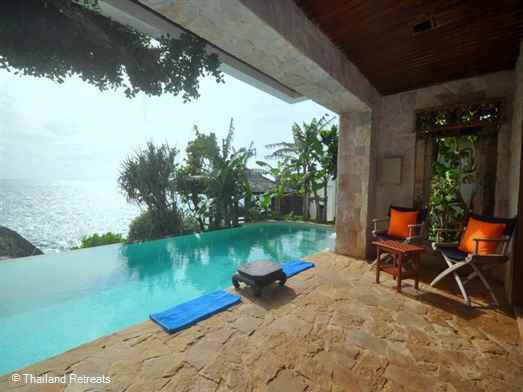 Villa is situated on a hill with a direct unblocked view of the sea. 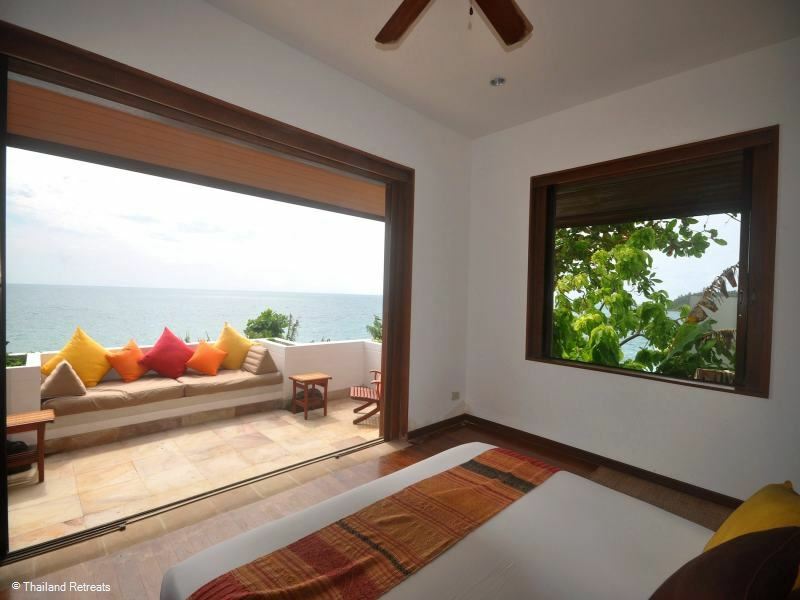 The master bedroom directly faces the sea, so you can wake up to a beautiful ocean view. It is also within walking distance to downtown Kata area. 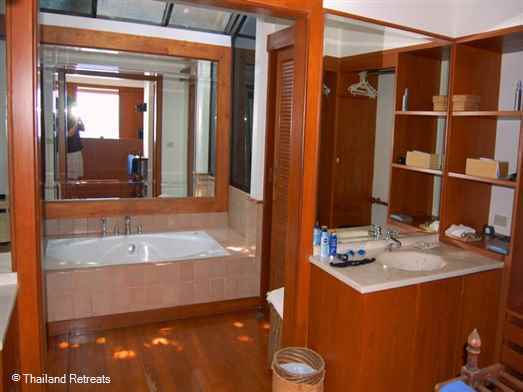 There are 3 separate rooms (each a self contained structure), so there's more than enough room for 6 people. All amenities are included (pool, dining area, living area/ study), so you don't even really need to leave the villa much. Nok is also such a wonderful housekeeper who cooks the the BEST thai food. My friends and I had tried a few local eateries out, but Nok's cooking was the best! She'll show you a menu, you choose what you want, and she'll head to the market to buy the necessary ingredients and cook you an amazing meal. Apart from one rainy day, weather in August was also brilliant. 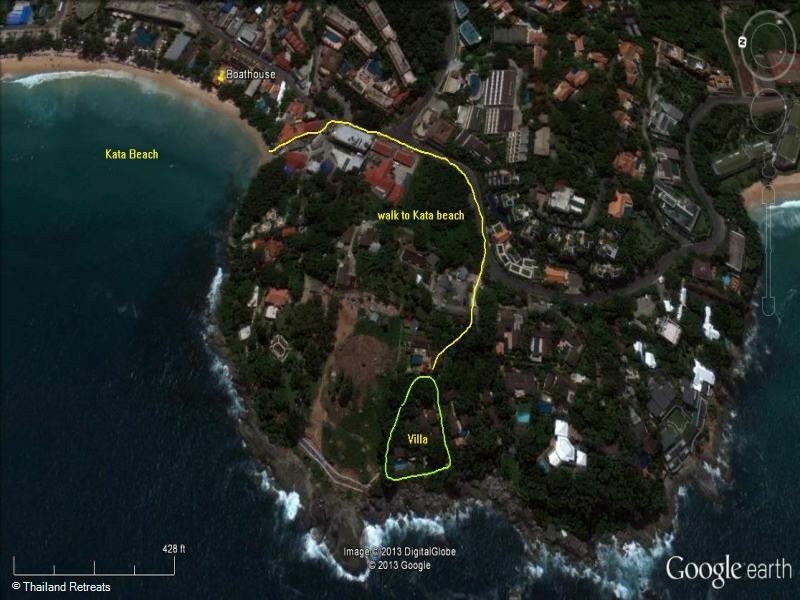 The villa is right next door to an upscale development (Kata Rocks) which is currently being built. That being said, we did not notice any significant noise from the construction. Only thing to note is that you need to climb / descend a bunch of steps to reach the villa. Personally, I found this good exercise! Wifi was also slightly patchy (depends on where you are in the villa, as its a reasonably sized property). Kata beach is great, nice and clean and warm water to swim in. House was great and in fab spot, cook good also. Nice place to be away from the city. I traveled here with my girlfriend and her family over the Christmas holiday and we were all extremely happy. There was plenty of space, the pool was amazing, the views were stunning, the services of the housekeepers and cooks were top notch. The layout was great and gave us the privacy we needed for a big group. if it hadn't been for some construction noise that we were told would be finished I would've given it 5 stars. I believe the review below is a huge exaggeration about the noise. Yes, it was a little loud at times, but it did not ruin our vacation at all. As far as the steps, there were quite a few, but all the cleaning ladies and staff carry all your luggage upon arrival and departure up and down and the climb up and down is perfectly fine and I think the renter should've inquired about having old members in their group. 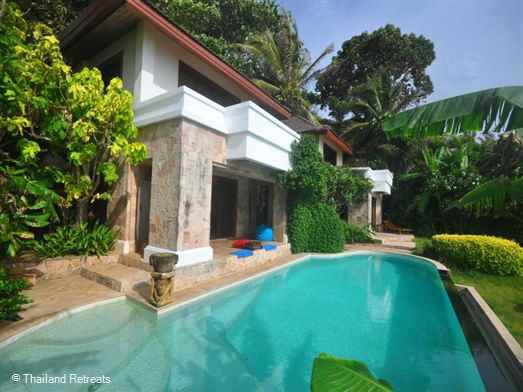 The location is a short walk to both beaches and town and airport pickup and drop off come with booking. The internet was pretty poor, but when I'm traveling to Thailand, I'm not really looking to be on my computer much anyway. I highly recommend this rental for a big group traveling to Kata!